African Literature Broad Notes Novel Things Fall Apart Okonkwo as a Tragic Hero in Chinua Achebe's Novel "Things Fall Apart" or Character of Okonkwo. Okonkwo as a Tragic Hero in Chinua Achebe's Novel "Things Fall Apart" or Character of Okonkwo. Okonkwo, the protagonist of the novel, was tall and stout with bushy eyebrows and a wide nose on his face. He looked strict, severe and harsh. While sleeping he snored and breathed heavily. He walked on his toes, raising his heels. It looked as if he would pounce upon someone. He lacked patience, whenever he was angry, he didn’t use words rather used his fists. Okonkwo was self made. He was wealthy and well-known throughout the nine nearby villages. His fame was by his hard work and personal achievements. His father, Unoka was a drunkard and heavily in debt, he could not provide the member of his family enough to eat. Okonkwo was in contrast to his father. Unoka was a coward, poor, idle, gentle and interested in music and wine only. Whereas, Okonkwo was brave, wealthy, violent and adamantly against music and emotions. But he often drank palm wine on auspicious occasions. He was a man of action. When he was Young he had won fame as a great wrestler throughout nine villages. He had two barns full of yams When he married his third wife, he had displayed his courage in two inter tribal Wars and had taken two titles. He was bold and never feared of war; he could hear blood-shed. He brought first human head to home during the latest war in Umuofia and that was his fifth head. 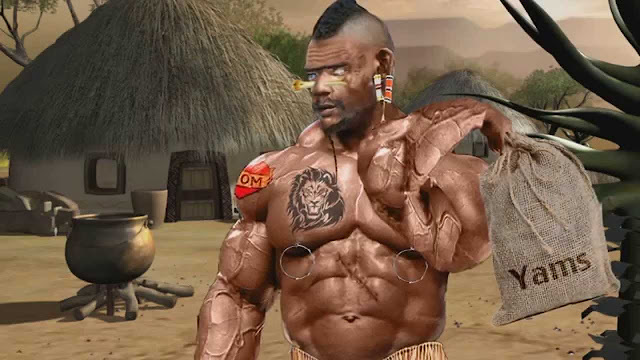 He was a respected and trustworthy man in Umuofia He was chosen as a great messenger of war to he sent In Mbaino. There he was treated with great honour and reverence and after two days, he returned with a lad of fifteen years named Ikemefuna and a young virgin, as decided in a public meeting addressed by Ogbuefi Ezeugo. Okonkwo has a fear that he too would be weak and a failure like his father Unoka. That was the reason; he was stem and strict towards his family. His three wives and eight children were afraid of him. He was not cruel at heart. He feared of himself lest he or his family should see evil days as his father did. He remembered how he had to cut a sorry figure when he listened from a clansman that his father was “Agbala”— a person who is like a woman. He was a hard worker, diligent and very strong. He worked on his farms from dawn to dusk and treated it as worship. He didn’t inherit anything rather he raised in his life through constant struggle and hard work. He faced a lot of hardships from the very outset of his career. When he started farming, he went to Nwakibic who promised him to give him eight hundred yam seeds. The very year when Okonkwo took Yam seeds was the worst year for farming. It rained late and was not sufficient for a good crop. But he didn’t lose hope. Those seeds were his own; he still had eight hundred from Nwakibie and four hundred from his father’s friend. He planted again that year it rained heavily and washed away the yam. The barns were full of water which destroys the seeds. Crop was looking like a funeral. One man of his village tied his cloth to a branch of a tree and hanged himself But Okonkwo remained a fierce fighter. He said. Then good days started, however. in his good days, became a little arrogant. He became somewhat rash, rough and haughty. In a meeting, he insulted a member and then other reprimanded him and he had to apologize. He ruled his and children with a heavy hand. If someone in the family disobeyed him he would even beat the member. Once during the week of peace, he beat his second wife and was subsequently punished by the priest of the goddess of earth, Ani. He had a great influence of his daughter Ezinma on him. She understood the moods of her father. When he returned after killing Ikemefuna, he didn’t eat anything for three days, It was only Ezinma who prepared the food and offered him to eat. He loved her with a wish that she were a boy. Okonkwo was a tragic hero in the classical sense. As he was superior character, well known throughout the nine villages, his tragic flaw: anger, rashness, short sightedness and violence brought his downfall. He wanted his son Nwoye to be a successful man in his life. That was the reason he treated him rashly without foreseeing that his harsh treatment might turn his son into a rebel. A sad accident added to his tragic end when, on Ezeudu’s funeral, a piece of iron exploded from his gun and pierced the body of Ezeudu’s sixteen years old son. It was a crime against the goddess of earth to kill a clansman • Consequently Okonkwo has to face seven years of exile in Mbanta, the native village of his mother. He wished that he would gain the same status in Umuofia, as he enjoyed earlier. But when he returned to his village after exile, he found that missionary campaign was at the climax. He wanted to face the challenges single handed but failed to do so. Consequently, he committed suicide for his failure of saving his culture from destruction. He was a true patriot and a flaming fire. His intense or dangerous anger has been associated with burning fire or flame. It was the only emotion that Achebe displayed in his character. As the fire destroys everything it consumes Okonkwo was both physically and emotionally destructive. Ikemefuna and Ogbuefi, Ezeudu’s son was the victim of his physical destruction. Whereas suppressing his emotions and fondness for Ezinma and Ikemefuna respectively was his emotional destruction. Just as the fire burns until it left a pile of ash. Okonkwo too burnt himself through intense rage until it destroyed him in the face of his suicide. He was a man of iron will and he moulded his fate to the path of glory with his own efforts. He made his fortune smile on him by his constant hard work. He struggled against poverty and rose to the status of prosperity. Despite facing many hardships, he was still determined to do hard work He built three huts for his three wives separately. He became one of the lords of clan and attended the meetings of the village. Okonkwo ended his life like a true hero for his ancestral culture and traditions. He was ambitious and a man of iron will. He fought many wars and brought human heads. He was a man of revolt but his short sightedness, anger, rashness and violence resulted his tragic end. Despite all his heroic qualities he failed to change himself according to the changed circumstances and that was one of the reasons that pushed him 10 take his own life.